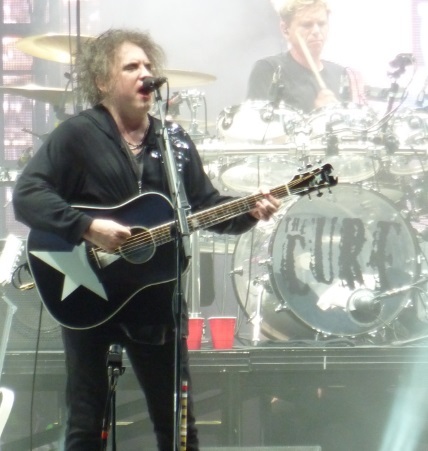 Their last trip to the Portland, OR area came more than a decade ago and it’s been nearly as long since they released an album of new material but regardless the 15,000 strong who packed the Sunlight Supply Amphitheater in Ridgefield, WA on Saturday definitely know the Cure. The Robert Smith fronted group played 34 songs for nearly three hours covering almost 40 years of music and if you arrived expecting a setlist of pure singles and radio fare you were in for a surprise whether it was a pleasant one or seemingly endless. No new album in tow either, but don’t believe for a second this was a Greatest Hits tour. In fact, if you’re not well-versed on what’s clearly a deep and satisfying catalog of Cure songs you likely discovered some new offerings, even if the tracts were 30 years old. The band nonchalantly took the stage at 8:05 p.m. opening with “Shake Dog Shake,” “A Night Like This,” then (remember?) “The Walk” and finally “Push” with that great opening jam before tackling some traditional favorites with “In Between Days,” the quintessential 80’s hit “Just Like Heaven,” and Smith bringing those yearning vocals on “Pictures of You” before diving back into deeper album cuts. With the exception of “Lovesong” the rest of the opening set consisted as Smith said, the “usual mix of weird stuff and not so weird stuff.” Actually if you want the proof to dispel any notion the Cure is simply a goth rock band, a description Smith also rejects, simply listen to “The Hungry Ghost, “Want,”, “The Hanging Garden,” “One Hundred Years,” and “Give Me It” – straight up rock songs that out-shined their studio versions on the live stage which closed out the opening set. The first encore arrived after just 18 songs, yes first encore. The band returned and played five more deep album cuts before encoring again. One more five song encore ensued mixed with more obscure songs and B sides along with “Fascination Street” and “Burn” their smash contribution for the soundtrack to the feature film The Crow in 1994. The only duds on this night came with the nearly 30 year old “The Snakepit” which sounded like a brand new song Smith and his bandmates were rehearsing which stalled the show a bit – requiring a few songs to get back to pace – plus ending the up-until-now make-out session by at least one couple, and “Freakshow” the lone song played off 2008’s 4:13 Dream the Cure’s last studio album. 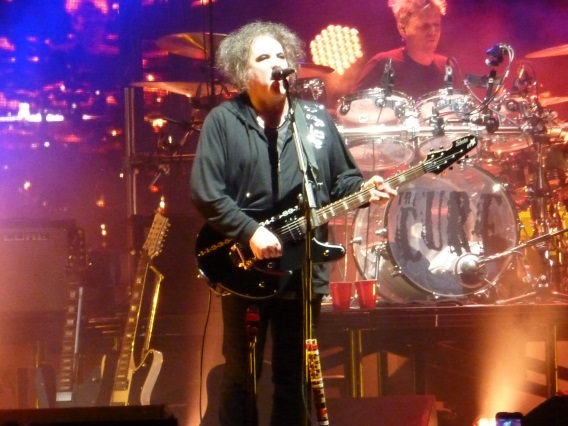 Smith, guitarist and lead singer, is the sole original member of the Cure which has seen a number of contributors since the band’s inception. In many respects Smith is the Cure. It doesn’t matter who makes up the ensemble backing him. His vocals, one of the most recognizable in rock music, can hardly be replaced. Now 57, Smith still dons the emblematic white make-up and crazy hair and sounds no different than he did in the band’s 80s heyday even if he looks a bit different. He’s not 27 anymore! He ripped through song after song never missing a note and playing electric or acoustic guitar on most. Smith is also backed by keyboardist Roger O’Donnell now on his third stint with the band, 20-year drummer Jason Cooper and newest member and mad scientist Reeves Gabrels, a doppelganger to Doc Brown, who spun off some solid shredding and solos when Smith wasn’t on lead. The Cure wasted little time between songs executing them one after another. Smith presence was his stage presence as far as the audience was concerned. He doesn’t interact much and spoke just a few times introducing a couple of songs but with such a heavy English accent, which obviously doesn’t come through when singing, we shan’t understand him anyway, so it was just as well. Perhaps the only waste of time was the encore, make that the encores. Sure, it’s their thing to leave and return a number of times but three (and sometimes four!) encores throws a wrench into the fluidity of the show. Besides the encore has lost its grace over the years as it’s evolved from the audience truly wanting the show to go on to simply a tradition and now a number of bands choosing to forego it altogether. So, when people begin to trickle out during Encore 2 even if some of the Cure’s biggest songs had yet to play you’ve either got tired audience members and/or people who don’t know the show isn’t over, anytime soon. Regardless, you certainly get your money’s worth with the Cure. But too bad this show wasn’t on Friday. Apparently, Saturday the Cure is not in love thus leaving off the setlist one of their most beloved songs. this review was pretty lukewarm for a performance that was pure FIRE. 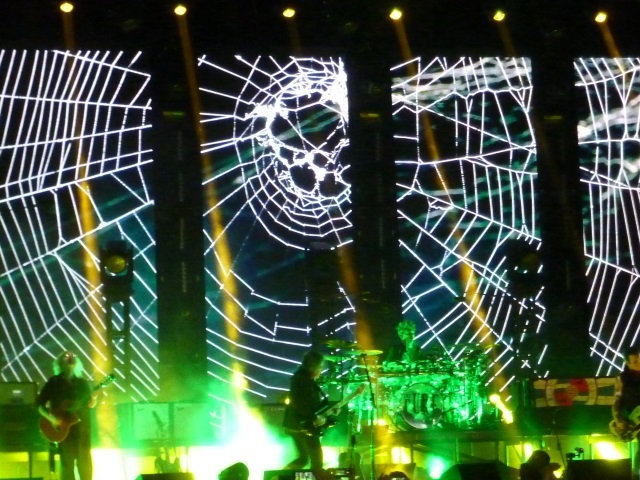 I for one found it refreshing that in a world of overpriced hour and half long performances, the Cure played for 3 hours. BECAUSE THEY ARE LEGENDS.